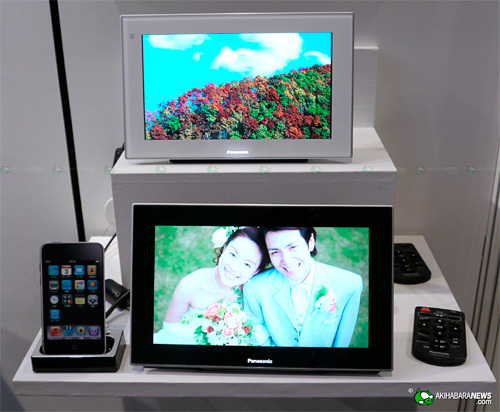 Panasonic iPhone Digital Photo Frame Prototype (*Updated) | OhGizmo! I’m normally not a big fan of the whole digital photo frame trend, but since I’ve been using my iPhone 4 more and more as my day-to-day digital camera, I like this prototype that Panasonic has on display at their booth at CEATEC. Instead of having to transfer photos to an SD card to load them up on the frame you simply dock your iPhone or iPod touch which is probably already chock full of galleries. Other details are pretty sparse, and since it’s a prototype who knows if it will ever see the light of day. If it does though here’s to hoping they find a way to better integrate that dock, since this side-by-side setup looks a little awkward. Update: iLounge has more details on the photo frame officially known as the Panasonic MW-20. It will officially be available in late November for $250 and includes a 9-inch hi-res display, a 5.6-mm “Super Slim Semi Dome Speaker” and the ability to play photos, music and videos from a docked i-device. I want your help. I like your site. Your articles are interesting. I entered here by mistake and I started reading. I became interested in the topic and I am thinking whether I could use your texts on my blog, of course with the quotation. Please write me back, thanks very much.